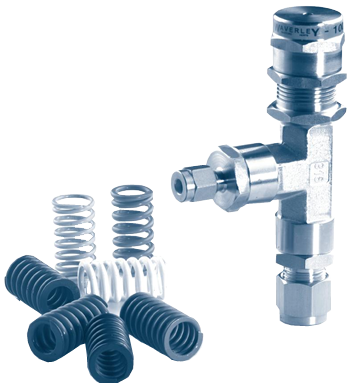 The Waverley brownall Manifold range of Precision Relief Valves and Strainers are manufactured to a very high standard in our own UK factory from top quality 316 stainless steel. 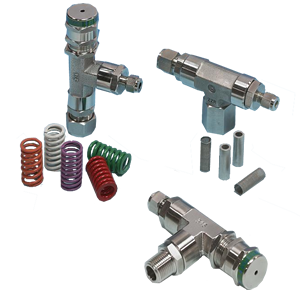 Both products have a safe working pressure of 6000 psi and come in a wide range of inlet and outlet end connections from 1/8″ to 1″ in a variety of thread forms, including Ringlok and Duoloc compression ends. When inline pressure exceeds the force exerted by the spring, the valve stem opens. The flow through the valve is proportional to the increase in pressure. As the valve is balanced, cracking pressure is not effected by outlet back pressure. The relief valve setting is adjusted by rotating the adjustment cap.